Collection accounts can be a huge headache for consumers, and can wreak havoc on a credit score. Debt collection in the United States is estimated to be a 12 billion dollar industry. The way it works, in a nutshell, is when an account becomes overdue to the point the creditor does not think they will get their money, they sell the debt to collection agencies for pennies on the dollar. The collection agency then attempts to recover what is owed. If a consumer has a debt sent to collections, he should receive a letter from the collection agency notifying him of the situation. If the collection is an error (reported incorrectly, or is not the consumer in question), he should contact the collection agency immediately to resolve the matter. However, if it is a true collection, the consumer does have rights afforded to him under the Fair Debt Collection Act. 1: The collector cannot threaten you. 5: They are also not allowed to misrepresent themselves as credit reporting companies, attorneys, or government officials. – Pay the collection. A consumer may choose to negotiate with the collection agency and pay the balance of the collection. In this scenario, the consumer needs to MAKE CERTAIN that the collector sends all offers in writing. – Not pay the collection. Deciding to not pay a collection may result in the collection agency suing the consumer. If the agency wins, the consumer’s wages may be garnished to repay the debt. Unfortunately, either way negatively affects your credit score. Once a collection has been reported to the credit bureaus, it remains on the report for 7 years, whether or not the debt is paid off. And, beware of paying old collections! Sometimes, consumers will mistakenly believe that paying off a collection account that is several years old will help to increase their credit score, and this is not the case. Paying off an old collection brings the date of last activity to the present, and the effect of the collection is felt all over again (which usually means the credit score drops). A good rule of thumb is to try your very best to stay current on your payments. If you fall behind, strive to not let the account go into collections. If you do end up with collection accounts, be prepared to deal with collection agencies, and brace yourself for a credit score drop. Once a collection hits your credit report, managing your other credit accounts wisely is the best way to rebuild your credit score. 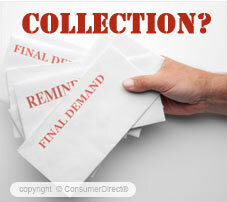 (For more information on collection accounts and consumer’s rights, read the FTC’s Debt Collection FAQ’s).